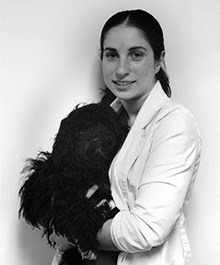 Dr. Nathalie Paiva is originally from northern New Jersey. She received her Bachelor’s degree in Animal Science from Rutgers University Cook College in New Brunswick, NJ. She went on to obtain her D.V.M degree from The Ohio State University College of Veterinary Medicine. Her interests include feline medicine, anesthesia/pain management and surgery. She currently lives with her husband and two feline companions, Yuca and Penne.